shiteatersubs presents Dr. Slump & Arale-chan episode 074 in Japanese with English subtitles. Thanks to Ken Agatsuma for his wonderful translation. Special thanks to Ramza, his donation for the translated script made this episode possible. Dr. Mashirito has gathered his army and he’s ready to go to war with Suppaman and the EDA! Now if only Arale will cooperate and be distracted by his poop robot long enough to blast her to kingdom come, the Mashirito Army might have a chance to win this thing … yeah right! – (spoilers) Butao proves he’s an important member of the EDA by performing a sneak attack on Caralmelman #3’s tire. Toriyama later reused this clever battle tactic in Dragon Ball Z when the character Yajirobe used a sneak attack in the same manner to sever Vegeta’s tail. 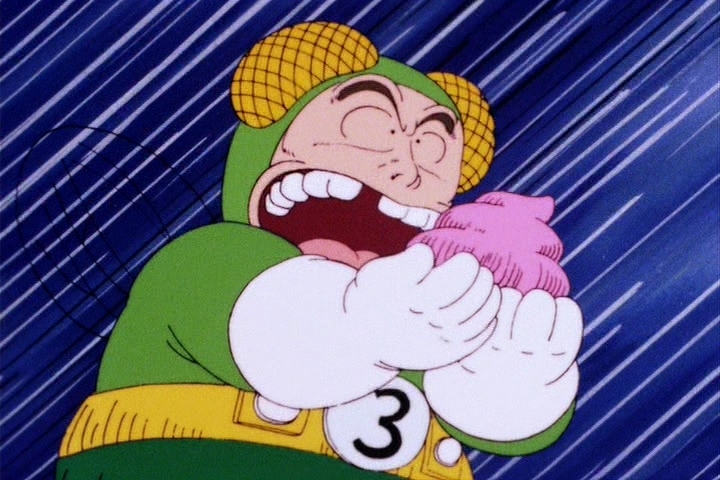 – (more spoilers) At the end of this episode, the show teases that Mashirito will himself become Caramelman #4. This was most certainly a case of the TV writers trolling the audience. 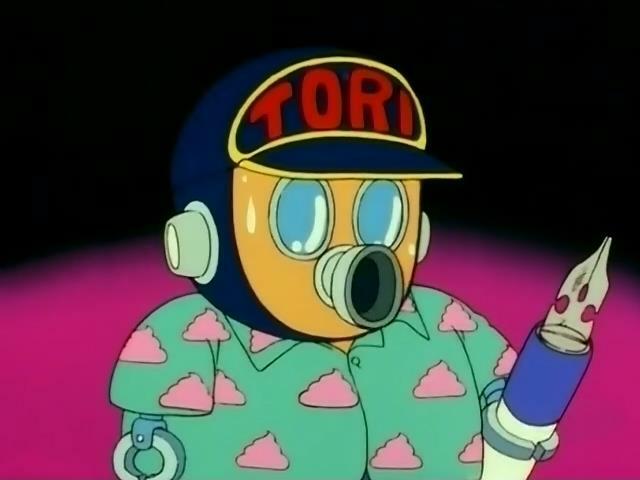 Now while Mashirito does eventually turn himself into a cyborg, we know from hindsight (Caramelman #4 didn’t appear in the manga until over a year after this episode aired) that Caramelman #4 is a separate robot who eventually becomes the beloved character, Obotchaman. – The next turn in the ever evolving Caramelman saga, the Penguin Village Grand Prix, takes place in episodes 80-82. The next one after that, the Obotchaman arc, starts at episode 127. Your work is really appreciated! Mashirito is hilarious. Apparently, he’s supposed to be based off Akira Toriyama’s editor at Shonen Jump at the time. Yes he is! It’s the same idea with Piccolo Daimaou from Dragon Ball, except Mashirito actually kinda looks like the guy! Senbei getting married? Hell must have truly frozen over for that to happen! Thank you so much for the episode! Thank you for upload and work in subtitled them.